Dr Martin Hirst explores parallels between the writings of Marx and Engels with today's capitalist destruction of the environment. 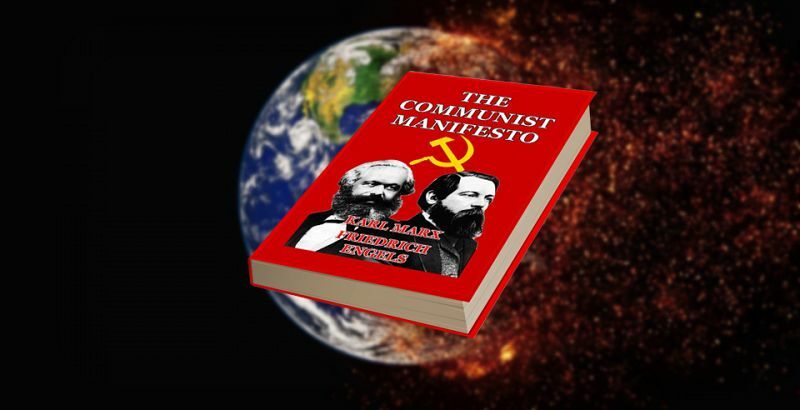 THE COMMUNIST MANIFESTO was authored by Karl Marx and Frederick Engels and first published in 1848. There is value and importance in one particular passage that is often overlooked. Perhaps this particular paragraph is not considered important because it occurs very early before the main arguments are fleshed out, but it is a reminder that there is nothing inevitable or pre-determined about revolutionary struggle. It is the final stanza here that catches attention: ‘the common ruin of the contending classes’. What Marx and Engels want us to know at this point is that while the class struggle is inevitable, there is no certainty as to the outcome. Other Marxists have since taken up this point — Rosa Luxemburg famously coined the aphorism ‘socialism or barbarism’ to describe the stark choice facing the European working classes during the First World War. 171 years ago today Marx and Engels published the Communist Manifesto. This problem has not gone away. In fact, it is safe to say that the “common ruin of the contending classes” confronts us squarely in the form of human-induced global warming. The reason for this is precisely what Engels was talking about — the ruling class has lost its ability to harness the productive forces of capitalism for social good and the incessant drive for profit that motivates the capitalist class is careening out of control towards environmental disaster. Believe it or not, Marx and Engels were acutely aware of the fragile relationship between human society and nature that is developed – to be exploited or nurtured – through humans’ labour. The source of all sustenance and value in any economic system first and foremost relies on human labour to extract the means of subsistence from the environment. If this is done in harmony with nature, then an environmental balance is maintained. If, as it is in a capitalist political economy, the relationship is one of unbridled exploitation, such that humans are alienated from nature, then this lack of balance will lead us into ecological disaster.
.@pye: "Insane understates how bad the ideas in this resolution really are. Both the Green New Deal resolution and the FAQ doc read like something concocted in a drunken haze in a college dorm room." Marx wrote about this precarious balance many times, describing humanity’s relationship to nature as a metabolic process. Human labour enacted upon nature provides societies with their means of subsistence and future development, but in true dialectical fashion, this relationship changes humans, societies and nature itself. Contemporary Marxists embrace this feature of Marx’s writing and use it to argue for a class-based solution to the environmental crisis. It is not overpopulation that is killing the planet, it is over-production of commodities on the basis of the extraction of surplus value, profit and wealth for the few and at the expense of the many. This is the “metabolic rift” that has alienated nature from us. Marx wrote about it in relation to nineteenth-century agriculture depleting the natural productive capacity of soils and causing contamination of urban rivers due to poor sanitation and unregulated dumping of chemical waste by the burgeoning manufacturing industry. The situation today is no better. In fact, we can argue that it is worse. Not only are we continuing to deplete the soil through intense agricultural practices, but industrialised farming requires pesticides and herbicides that are leaving behind a toxic residue. The nuclear power industry means that there are ever-expanding stockpiles of radioactive waste being left all over the planet for future generations to clean up. The accident at Fukushima, largely forgotten among all the other global horror stories, is a constant reminder that capitalism’s relentless push for progress only further alienates nature. Capitalism is the cause of the environmental crisis, it can never be the solution. It is capitalism that creates our alienation from nature by severing the direct relationship between producers, raw materials and the products of their labour. Alienated labour – the working class that does not own or control the means of production, but that is compelled to work for the benefit of the capitalist class – is the basis of our alienation from nature. Thus, we are returned to the possibility of either common ruin and a descent into barbarism on one hand, or the successful revolutionary transition away from capitalism towards a socialist society in which the metabolic symbiosis between human society and nature can be restored. ...is like the sorcerer who is no longer able to control the powers of the nether world whom he has called up by his spells. Society suddenly finds itself put back into a state of momentary barbarism; it appears as if a famine, a universal war of devastation, had cut off the supply of every means of subsistence; industry and commerce seem to be destroyed… And how does the bourgeoisie get over these crises? [By] paving the way for more extensive and more destructive crises, and by diminishing the means whereby crises are prevented. Marx and Marxists talk about the centrality of class politics and the class struggle to the process of historical change. However, there is no predetermined outcome. As Marxists, we know that political consciousness is a key ingredient to any successful revolution. The power of the working class lies in its overwhelming numerical strength when compared to the one per cent that makes up the ruling elite. The power to change the world for the better lies with the working class because it is the group that has the most to gain by returning to a symbiotic relationship with the natural world. However, there is a catch. The working class and its allies have to be self-conscious and understand both the necessity of revolution and its mechanics in order to win. Today, we are confronting climate collapse. This is the hideous face of twenty-first-century barbarism. Only a conscious revolutionary working class can lead the struggle to prevent this from being the reality we bestow on future generations.